Twice every day the water of the sea runs her fingers through the sand, leaving tell-tale patterns. These repeating patterns display in clear sight some of the hidden energies within the water. Everything the water touches is changed in some small way by the interaction, but often we can’t see or don’t notice. On this stretch of sand the sweet fresh water of a stream carves a channel into the sand each day. It’s pattern and shape reveal the flow of the energy running from the land into the salty waves. Twice in the day it’s pattern is lost, washed away into the body of the sea, unneeded as the ocean licks the stream bed in the rocks above the tideline. Yet it’s shape persists as the moon driven tides surge and fall in their own steady patterns. Here the firmly held shape of sandstone rocks merges into the shifting free grains of sand, with no clear edge. The energy of the waves rubs gently but persistently at the rocks edges. 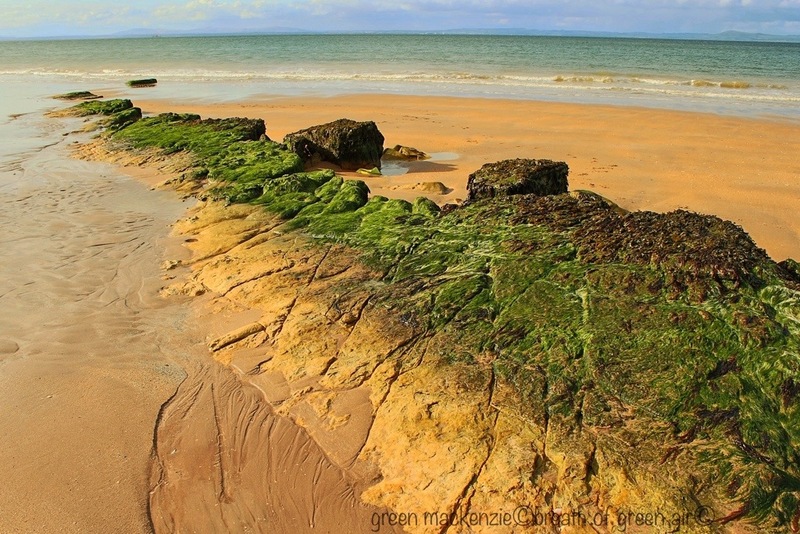 The green seaweed holds onto water for a while, after the rain falls or the tide drops. Slowly the water is released, leaving trailing patterns running from the rock into the soft sand. Every drop merging back into the body of the ocean. Just like the water, we leave patterns and trails around us as we move through the world. Sometimes we have repeating patterns which flow from us over and over. Patterns of action, emotion and thought, filling the spaces around us. These patterns in turn touch and effect everything they come into contact with. They flow into the lives and worlds of others, sometimes unnoticed, unseen, unrecognised, and yet powerful. All of us have an effect on the world and those in it, even when we say or do nothing. Silence makes its own patterns and soothing shapes. Stopping for a while to see if we can notice any of the clues around us can in itself re-shape the patterns around us. I always feel a little different when I have slowed down and taken the time to look at what might be unfolding around me. Mindfulness brings me into a deeper recognition and connection with life itself. You can see more photographs of patterns at the Weekly Photo Challenge. And more photos of beaches at Ailsa’s Where’s My Backpack Challenge. This entry was posted in mindfulness, photos, relaxation, spiritual, weekly photo challenge and tagged awareness, beach, mindfulness, nature, patterns, photography, postaday, relaxation, sand patterns, spiritual. Bookmark the permalink. I’m really impressed with your writing skills and also with the layout on your blog. Is this a paid theme or did you customize it yourself? Anyway keep up the excellent quality writing, it is rare to see a great blog like this one nowadays. Awesome photographs. I am so captivated by sand patterns as well. Thanks for sharing and stopping over at my blog to check things out. Beautiful!! As are the photos. Hi to every body, it’s my first go to see of this website; this blog includes awesome and actually fine stuff in favor of readers. I enjoyed this lyrical post and the photos that expressed the prose so well. The beaches of Scotland all look so beautiful, yet are totally different from our beaches in Australia and the South Pacific. Thanks Mary, lyrical is a lovely description. I imagine that the biggest difference between Scottish beaches and those in Australia, must be the temperature, of both air and sea 🙂 but that keeps them nice and quiet for most of the year…..until the school holidays in summer. Lovely photos as always and thought provoking. These were of course taken very close to your home 🙂 thanks for the encouraging compliment. You are welcome ! I like the way you look at the world around you, and I have been reading some of your mindfulness posts with interest.I can see how it could help slow things down. “greatly enjoyed it” We were only able to be there for a few days, but had a blast. Thanks Janet. There’s so much to see and do in Edinburgh that it can be hard to find the time to leave the city. However there is so much within just half an hour that its well worth the effort required to drag yourself away 🙂 hope you make it back soon! I know, those ruts and ridges are yummy, they feel very satisfying under bare feet. I’m always drawn to them and the rhythm they hint at. I guess we need some repetition, some ruts, in our lives, but just not too many. Another lovely comment, thanks Fi. Wow!!! AMAZING shots!!! Really excellent take on the theme! Cheers! What a stunning collection of ocean made patterns, lovely!! I love the patterns in the sand, your photos are wonderful. I too used the sand patterns as one of my photo challenge entries. I love the randomness of the patterns, never the same the next day. Oh Lily, lovely to meet a fellow sand pattern fan 🙂 thanks for the compliment, I really enjoyed your post too. Both you photos and your words are beautiful! Where is this beach? 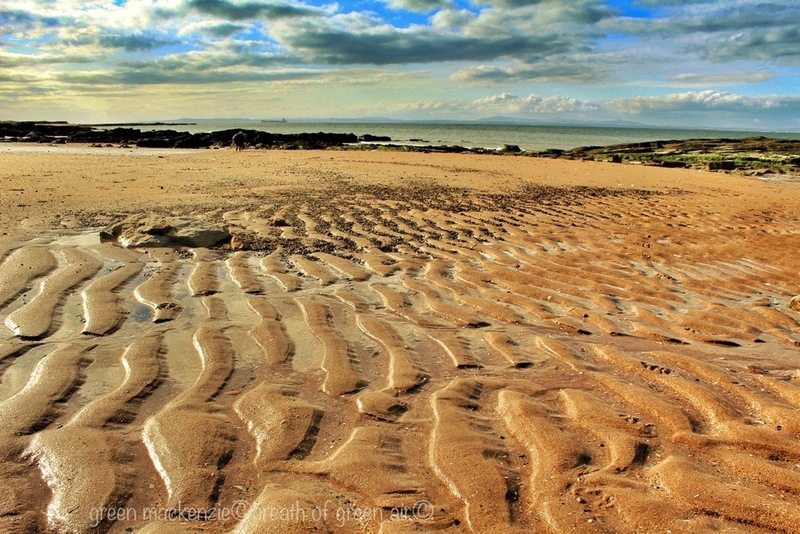 It’s Gullane beach in East Lothian, just a few miles east of Edinburgh, Scotland. Wow! Just love that first shot. Nicely done. Ohmigosh! Woww! Just Wow! Where in Scotland were you? 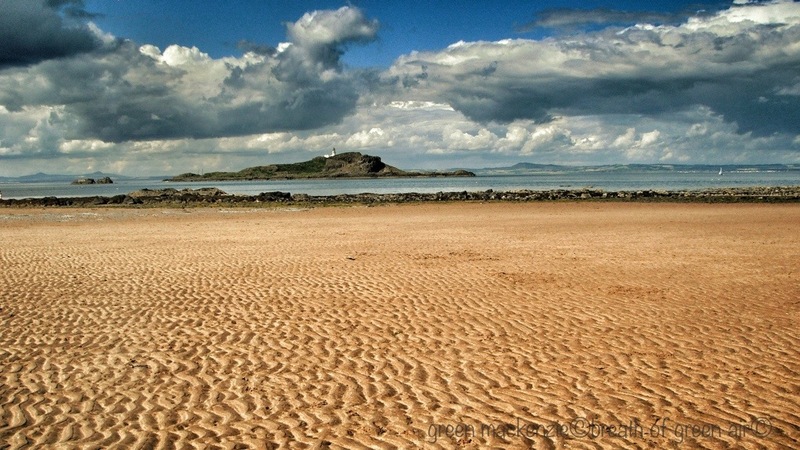 The first three were taken at Gullane, and the fourth was on the next beach along, at Yellowcraig. 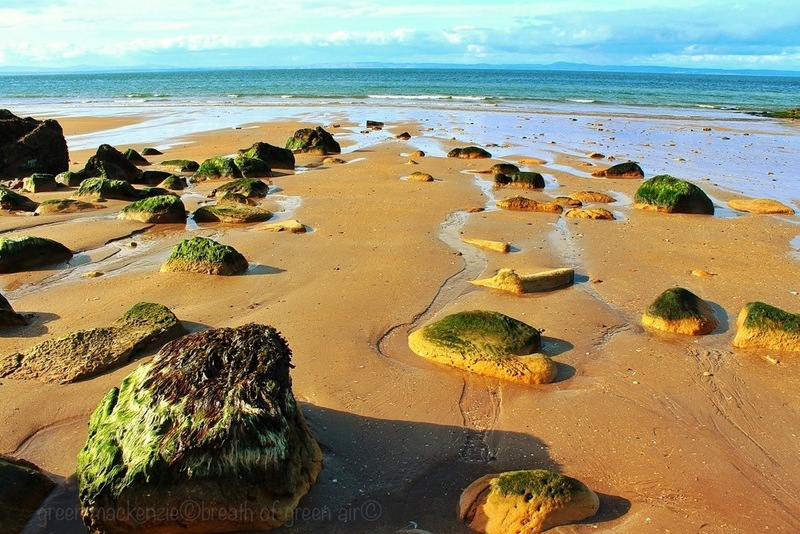 They are beaches on the shores of the Firth of Forth, in East Lothian, Scotland. Just a little east of Edinburgh, 15 minutes from my house. I walk the dogs there regularly. This could be, I have no doubt, the best interpretation of this week’s theme. One of the best shots of how nature had carved out its own pattern. Always glad to hear I’m provoking thought….but remember too much thinking can lead us astray 🙂 thanks for the great compliment . The beaches on Scotland made us feel very reflective as well. Hopefully we’ll be able to spend more time there in the future. Your photos are lovely! Thank you for sharing them! What a beautiful way to help us focus on the more subtle things in life, which is not always that easy to do… The metaphor of sand and water is very inspiring, and so are the photos! Happy Mothers Day to you….we had our one back in March in the UK….feels like a long time ago now that winter is finally gone! Beautiful shots Seonaid! I love your closing thought.mwell said! Profound thoughts, and I have spent many minutes staring at those pictures. Your beach is so … different! It seems allmost alien, like I found the quality of the light at the top of Skye.. I know what you mean about the light up in Skye….well really all along the North West coast of Scotland….and then East Lothian definitely has its own special light. I have a thought that it might be because it juts out into the North Sea, so there’s lots of reflected light in the air? These photos were taken during winter, a couple of months ago, so the light is quite soft …. Michelle, what a lovely comment. I’m glad you enjoyed the post.